As we all know soda is terrible for us, juice is similarly high in sugar, and many healthy alternatives aren’t always affordable. Ideally, we all would simply drink water, but if you need a little something extra, this guide’s the ticket! These aren’t sweet waters, it is water with subtle flavors infused into it. A touch of flavor – not an explosion of flavor – with little or no sweetness. 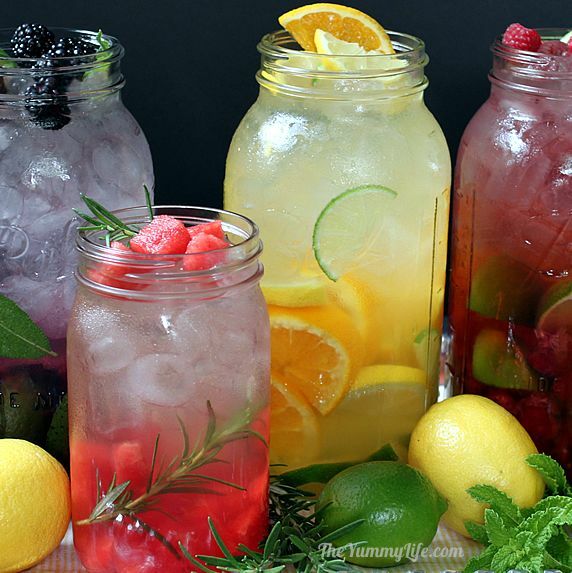 You’ve probably had pitchers of ice water with lemon served at restaurants. This is the same idea, but with more variety. My natural tendency is to go overboard and over complicate things, so I really have to fight that when I’m developing recipes. 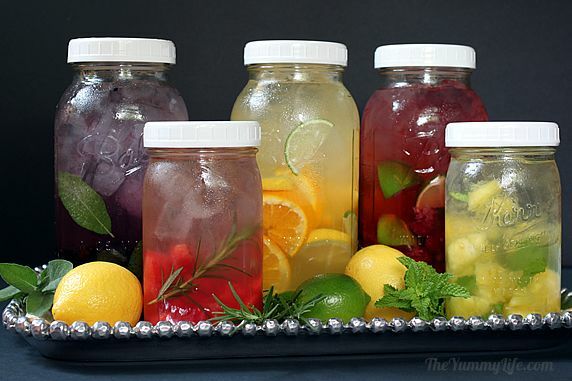 My easy formula for making KISS flavored waters is to use only fruit and herbs, water, ice, and a jar or pitcher. Fruit – Whatever kind you like (except bananas); make sure it’s good and ripe for maximum sweetness and flavor. I like to use all kinds of citrus and berries. I also found pineapple and watermelon to work well for flavoring water. 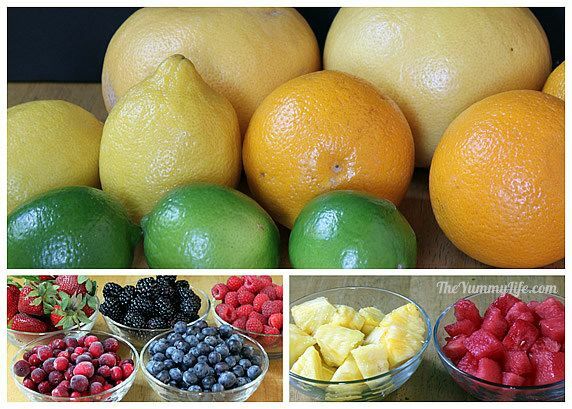 If you don’t want to buy whole ones, many grocery stores sell small containers of pre-cut fruit. Herbs – These are optional, but many herbs are a surprising complement to fruit flavors. Jars or Pitchers – I use 2 quart mason jars primarily, but any 2 quart pitcher will do. Fruit Infusion Pitcher– Another option if you think you’ll be making infused waters regularly; a very easy, tidy way to strain fruit from water. Fruit Infusion Water Bottle– I love using this for a portable, on-the-go option. Muddler or Wooden Spoon for mashing fruit and herbs. Water – I use filtered water. When in season, I prefer to use fresh fruit. However, when fruit is out of season, the fresh version can be tart or flavorless. Because fruit that is to be frozen is picked at the peak of ripeness, it is often the better option for the best flavor, sweetness, and nutrients. I find this to especially to be the case with berries and peaches. Use whatever herbs you like or happen to have on hand. I picked all of these from my herb garden and have tried them in flavored waters. 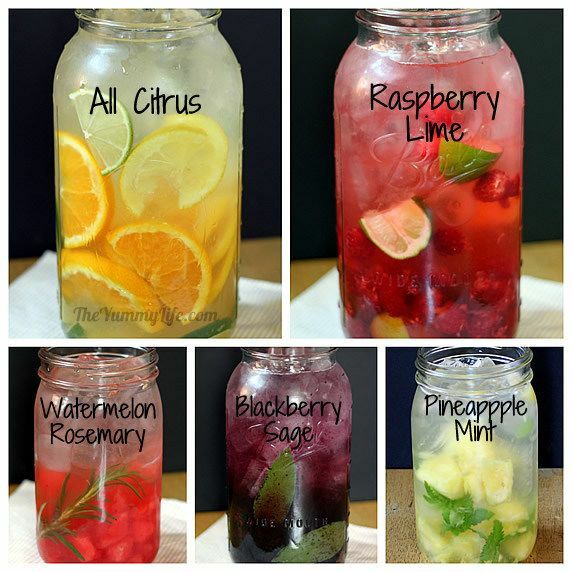 It’s surprising how well they blend with most fruit flavors, and they amp up the refreshing factor of the water. Mint is the most obvious herb choice. I also have tried basil, rosemary, sage, thyme, lavender, and tarragon.All good. Adds refreshing tartness to water. Slice 1 orange, 1 lime, 1 lemon into rounds, then cut the rounds in half. Add to jar, press and twist with a muddler or the handle of a wooden spoon. Press enough to release some of the juices, but don’t pulverize the fruit into pieces. Fill the jar with ice. Pour in water to the top. Stir it with the handle of a wooden spoon or a chopstick. Put a lid on it, put it in the fridge, and chill. Beautiful color and mildly tart. Quarter 2 limes; with your hands, squeeze the juice into the jar, then throw in the squeezed lime quarters. Add raspberries. Press and twist with a muddler to release some of the juices (don’t pulverize the fruit). 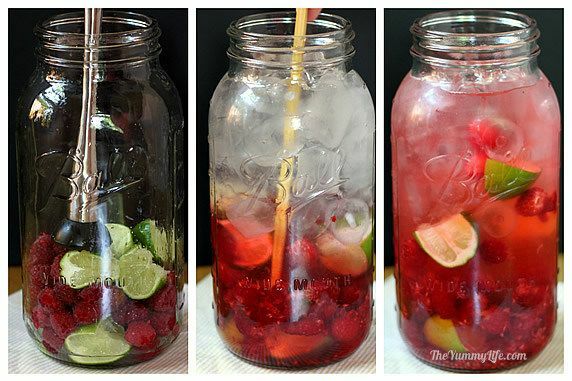 Fill the jar with ice, then add water to the top. Stir, cover, and refrigerate. A hint of minty sweetness. Add a sprig of mint to the jar or remove the leaves from the sprig, if you prefer to have the mint swimming around and distributing in the jar. Muddle the mint – the goal is to bruise the leaves and release their flavor; avoid pulverizing them into bits. 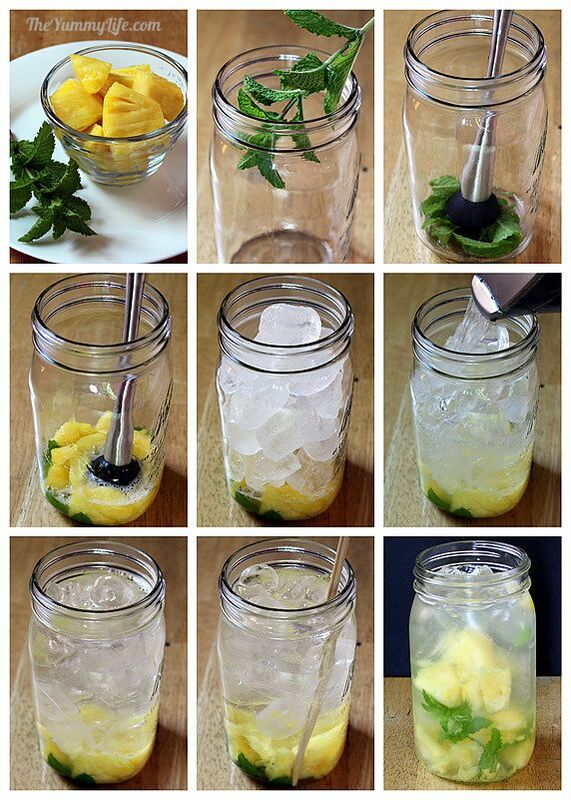 Add pineapple pieces, press and twist with the muddler to release juices. Add ice to the top and then water. Stir, cover, and refrigerate. Subtle and refreshing flavor. Add sage leaves to jar and bruise with a muddler. Add blackberries; press and twist with muddler to release their juices. 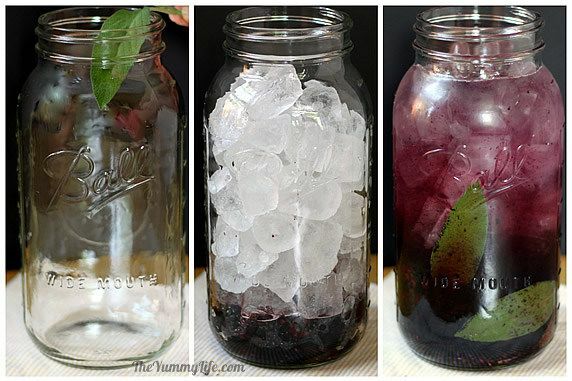 Fill jar with ice cubes, add water to the top, stir, cover and refrigerate. Lovely flavorful combo. Add a sprig of rosemary to jar and muddle gently (rosemary releases a strong flavor without much muddling). 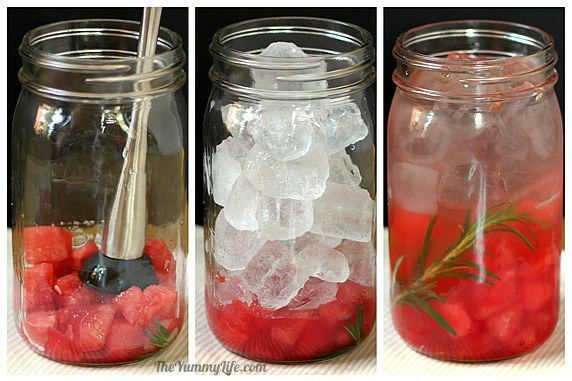 Add watermelon cubes; twist and press gently to release juices. 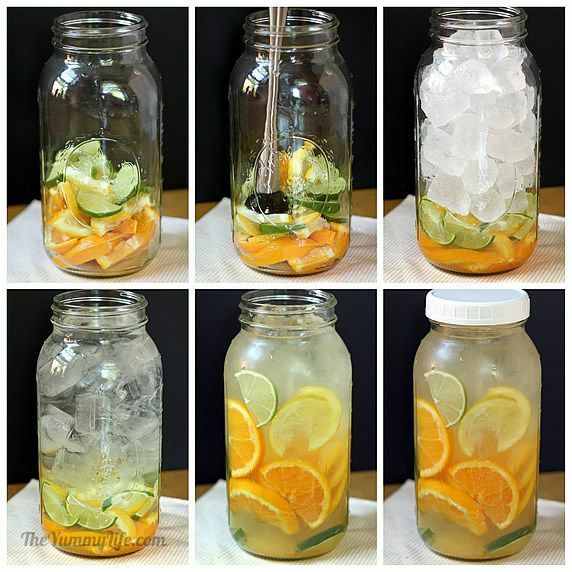 Fill jar with ice cubes, add water to the top, stir, cover and refrigerate. When there’s still ice left in the jar (my ice lasts up to 24 hours in the fridge), it will filter out the fruit/herb bits as you pour the water into a glass. 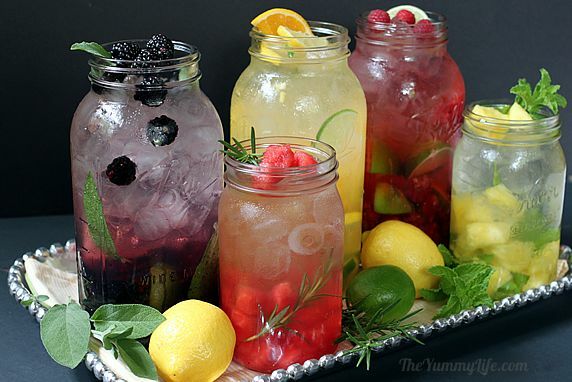 After the ice melts, if you don’t want to drink fruit bits along with the water, use a small wire strainer to remove them as you pour the water into your drinking glass. Alternatively, you can use a sprout strainer lid made to fit wide mouth mason jars. 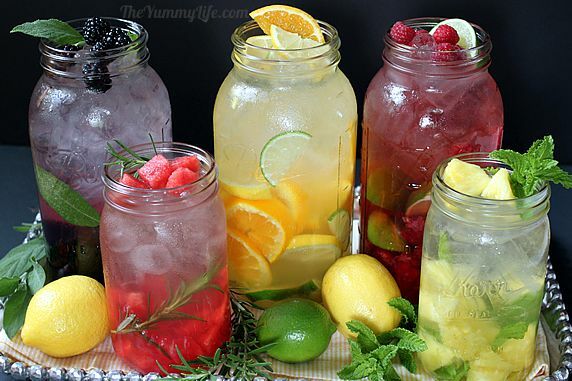 If you have a sweet tooth and find these flavored waters undrinkable without some sweetener, go ahead and stir in some simple sugar syrup, honey, agave syrup, or whatever sweetener you prefer. 1 teaspoon of sugar only has 15 calories.